I love October. It’s full of spooky, Halloween-related things and delicious pumpkin everything. October also means it’s time for another Dewey’s 24-hour Readathon, which tend to be the most awesome bookish events of the year. 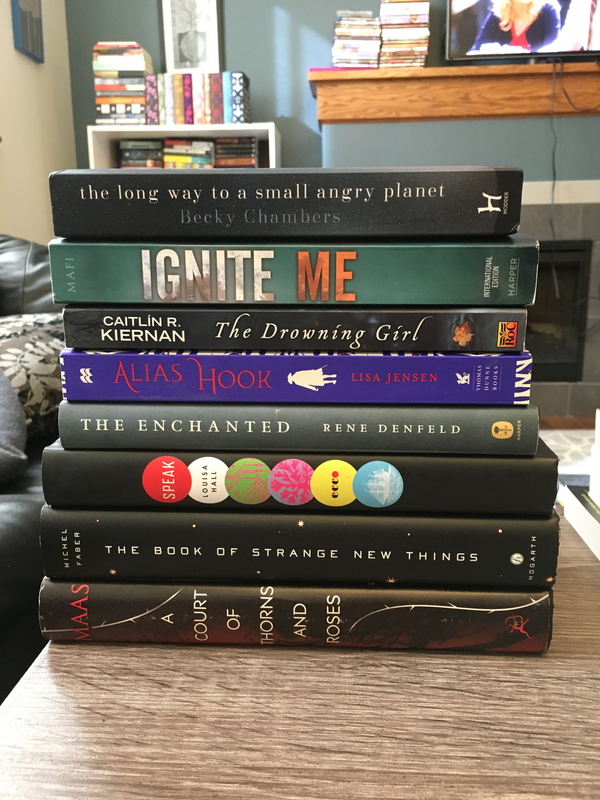 One of my favorite parts about the readathon is actually the anticipation and planning that come before the event; I love creating a TBR pile to sustain me through extended periods of reading, and figuring out how to maximize my reading time when I know I’ll still have to do things like work and sleep. For me, the Readathon starts at 8 a.m. on Saturday morning. Like last time, unfortunately, I have to work the morning of the Readathon; I’m planning to get as much work as I can done ahead of time so that I can leave work in the early afternoon, hopefully by 1 or 2. I’ve found that listening to my audiobook on the way to and from work helps get me into the Readathon mindset early, even if I can’t fully participate until later. I had to work the morning of the previous Readathon, too, and this really burnt me out (being on call for work all weekend didn’t help, either; once I started reading I kept getting interrupted). At least I’m not on call this time! And I’m planning on picking up Thai food from the delicious place near my office to bring home after work, as well, which is also a good motivator. Once I finally get home, I’m hoping to hit the Readathon hard. I’ve found that it helps me to start with shorter books so that I can feel like I’m accomplishing something; that way, if I get stalled on my reading later, I’ll still know that I’ve hit a few reading goals. My TBRs for readathons tend to look a lot different from my monthly TBRs. I find that short books, YA, fast-paced reads, and graphic novels tend to work the best for me in a readathon; I need books that can either hold my attention for an extended period of time or that allow me to jump back and forth pretty quickly. I tend to look for “easier” reads and not try to tackle anything too ambitious, as reading an extremely complicated book for a few hours can make me start to look for a reading break rather than feel inspired to keep going all night long (which I never do, by the way. I’m a terrible sleeper to begin with and I can’t afford to give up a whole night’s sleep). I also need a good, absorbing audiobook that I can listen to while driving and doing random things around the house so that I don’t lose out on reading time if I need to get other things done. Forest of Memory by Mary Robinette Kowal – this is a science fiction novella by the author of Shades of Milk and Honey, which was sort of a Jane Austen retelling with magic that I read a few years ago and liked but didn’t love. This shorter novel is about a woman who loses contact with her A.I. and is unable to connect with the outside world, something that is constant and ubiquitous in the future, and has to deal with some sort of scary situation in the woods. I don’t really want to read too much about the plot since it’s a short work and I don’t want to spoil it, but it sounds sort of Octobery and I’ve been in a science fiction mood lately, so this is currently #1 on my list. Fun Home: A Family Tragicomic by Alison Bechdel – this is a graphic memoir about a daughter finding out that her father was gay after his death. I previously read Evie Wyld’s Everything is Teeth, another graphic memoir, and really enjoyed the format; I think this will be a good graphic novel to go with for the readathon. 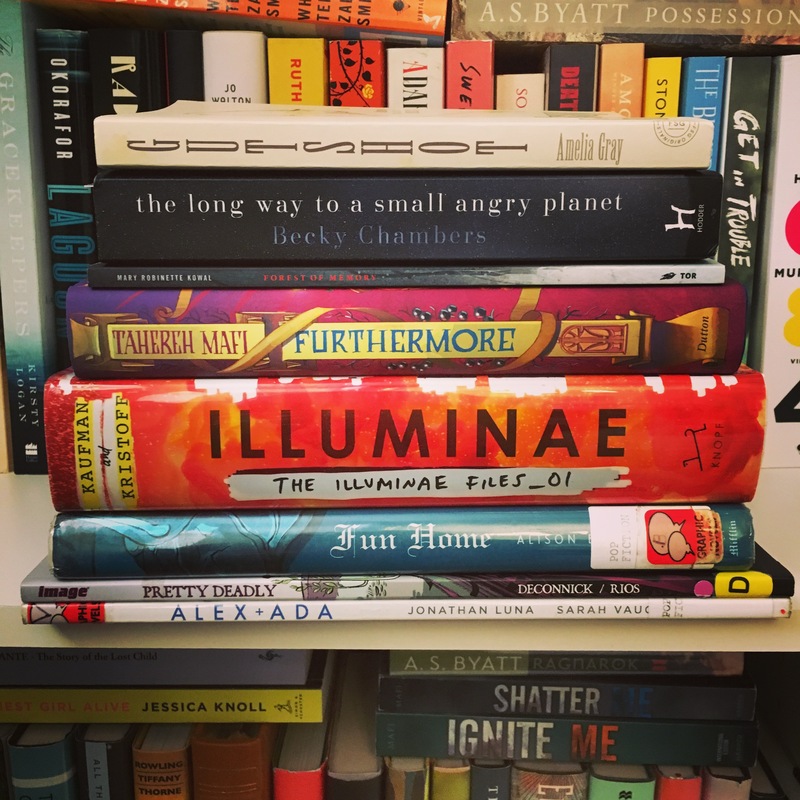 Illuminae by Amie Kaufman and Jay Kristoff – I was sort of waffling about whether to read this for a really long time, until I sort of did a 180 and decided I needed to own this book immediately. It’s science fiction YA about two teenagers who break up and then get caught up in this huge adventure/conspiracy where their planet is at stake; the reason I think it’ll work well for the readathon is that it’s not written in a straightforward book way but made up of transcipts, emails, interviews, etc. I heard that it’s fast-paced and an easy read, so I think this might be the perfect thing for me. Pretty Deadly by Kelly Sue DeConnick and Emma Rios and Alex + Ada by Jonathan Luna and Sarah Vaughn – I don’t know much about either of these graphic novels but I’ve seen them both recommended around BookTube. I tend to only pick up graphic novels during Readathons, so it’s always sort of fun to jump into a new one to mix up my reading. The Long Way to a Small Angry Planet by Becky Chambers – this is my current read, and it’s fantastic. I don’t usually tend to go for what I’m currently reading during Dewey’s, but I like having it as an option. The Geek Feminist Revolution by Kameron Hurley – this is my audiobook pick, and while I’m really interested in the content, I’m not loving the audio narrator so far. If it keeps going the way it is I might have to do a last-minute switch! Gutshot by Amelia Gray – this is a dark, supposedly super disturbing short story collection; I’ll pick this up if I’m in the mood for something October-y. Furthermore by Tahereh Mafi – I started this middle-grade novel last month but wasn’t really getting into it; I think I need to give it another try because I’m a huge fan of Tahereh Mafi and the worldbuilding did seem very cool. So that’s the plan for Saturday! Who else is participating? What are you planning on reading? Feel free to link me to your posts, I love to see what everyone else is doing for Dewey’s! So, I had a rough month at work with lots of stress (fun times!) which, for me, translates into lots of book buying. Consequently, I am getting super excited about my fall and winter reading as my TBR shelf continues to shape up. The Book of Strange New Things by Michel Faber – this is a literary scifi book (my favorite kind!) about a man who travels to a distance planet to act as a missionary, and is separated by galaxies from his wife, who is encountering all sorts of issues on Earth. I’ve seen some very positive and very negative reviews of this one; it wasn’t previously very high on my TBR list, but I saw it was on sale at Barnes & Noble and had to scoop it up. I know a lot of people also really loved Faber’s previous book The Crimson Petal and the White, but the synopsis of that one doesn’t grab me at all. The Long Way to a Small, Angry Planet by Becky Chambers – I FINALLY got this book from Book Depository after ordering it over a month ago. It’s about a space voyage and focuses on a small crew and their interactions; it seems like it’s universally loved and I’m very excited for it. My favorite kind of science fiction is character-driven and/or focused on the sociology of alien peoples, so this should be right up my alley. A Court of Thorns and Roses by Sarah J. Maas – I actually checked this out of the library twice to re-read it before ACOMAF came out, which was how I knew I should probably just go ahead and buy it. I’m not a fan of Feyre’s relationship with Tamlin, but I do enjoy aspects of this story and it’s one I’d definitely revisit in the future. I’d also like to own this entire series once the other books are released, so there’s that. The Enchanted by Rene Denfeld – another book I’ve already read, this was a 5-star book for me a few years back. The writing is beautiful but discusses such horrific things; it’s a short book but done so, so well. The Enchanted focuses on death row inmates and an investigator working to gather information for the inmates’ defense; it’s brutal and real, but told in this sort of strange, detached way with fairy tale elements introduced throughout the book. If you haven’t read it already I highly recommend it. Ignite Me by Tahereh Mafi – this is the last book in one of my absolute favorite YA series, and I’ve been wanting physical copies of these books for awhile. Now all I’m missing is the second book, Unravel Me; I’m just waiting for it to pop up on Book Outlet. Speak by Louisa Hall – this was a total impulse purchase on Book Outlet, and it sounds fantastic. Seriously, here’s the synopsis from Goodreads: “A thoughtful, poignant novel that explores the creation of Artificial Intelligence — illuminating the very human need for communication, connection, and understanding. In a narrative that spans geography and time, from the Atlantic Ocean in the seventeenth century, to a correctional institute in Texas in the near future, and told from the perspectives of five very different characters, Speak considers what it means to be human, and what it means to be less than fully alive.” This one is moving to the top of my TBR list. The Drowning Girl by Caitlin R. Kiernan – this is about a girl struggling with schizophrenia and attempting to determine what is real in her world as she starts to encounter elements of fantasy. This was nominated for a ton of awards in 2012 and won both the Bram Stoker Award and the James Tiptree Jr. Award. Alias Hook by Lisa Jensen – reading Second Star by Alyssa Sheinmel last month (a YA retelling of Peter Pan set in Southern California) put me in the mood for more Peter Pan retellings. I prefer retellings where Peter is cast as the villain, as I’ve never liked him; he has always seemed very creepy to me. This is an adult version of the tale that focuses on Captain Hook as the protagonist, and how an adult woman appearing in Neverland throws a wrench into the story. I also hit up a really great library book sale earlier this month and picked up 11 (!) books (at $1 each, this was definitely a steal). This particular book sale seemed to have a lot of classics/modern classics and not a ton of contemporary fiction that I was interested in. 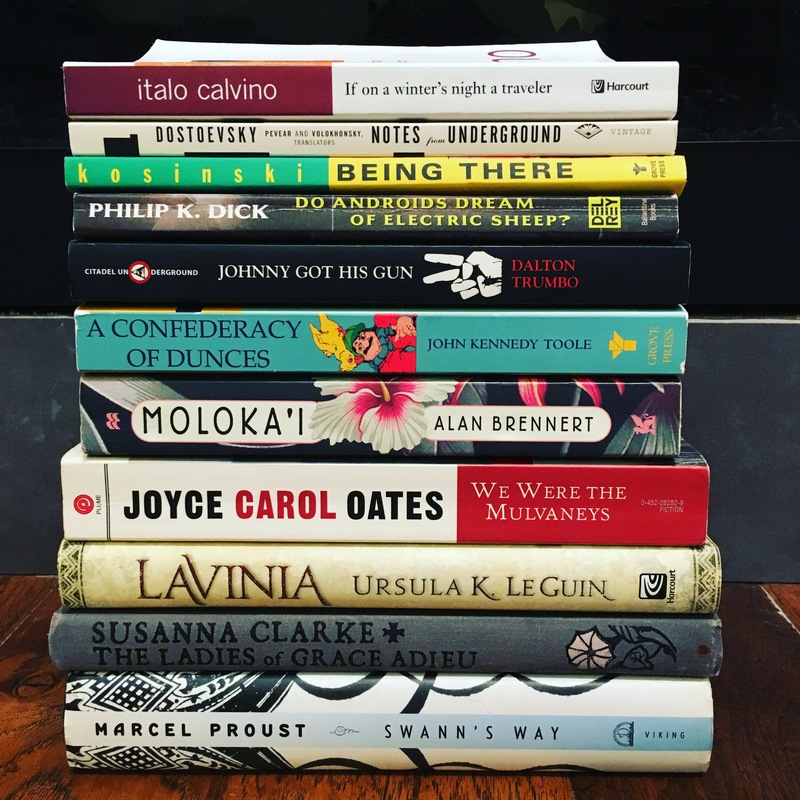 I seem to be having this problem lately where I really just have not been reading classics at all, despite continuously setting goals to do so; I read a ton of classics in my late teens but have tended to read more contemporary works in recent years. The problem is that I buy a ton of classics and they are sort of sitting on my shelf judging me. The reason I keep buying them is that I know I’ll get to them at some point in my life; I may drift in and out of classic-type moods through the years. Who knows! Anyways, the book I’m most interested in from this haul is Italo Calvino’s If on a Winter’s Night a Traveler, which is written in an experimental format that seems to divide readers between love and hate. I also am interested to see if Susanna Clarke’s short story collection The Ladies of Grace Adieu is as wonderful as I found Jonathan Strange and Mr. Norrell. There’ll be one more book haul post this month, as I am suffering from a severe BookOutlet addiction. Has anyone read any of these? Which should I pick up sooner rather than later?